When you have a group of people meeting for the first time, it is natural for participants of the group to feel out-of-place or nervous about how they will come across to others. Ice breakers are intended to help people get to know each other and become more comfortable with each other so they can communicate or work together better. 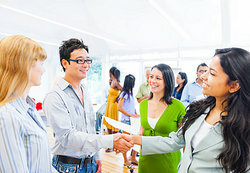 Ice breakers can also be used any time two people or more people meet and want to start a conversation or relationship. Ask everyone in the group to go around in a circle and say their names and where they are from. Ask everyone in the group to introduce themselves and say three things about themselves that they would like the group to know. Ask people to team up into small groups to complete a simple scavenger hunt. The scavenger hunt can involve things like "find someone who has an unusual hobby" or "find the person who has traveled the farthest to be here." Have everyone in the group line up according to their birthdays or have everyone line up alphabetically by first name or last name. Play "people bingo." This involves giving out cards with attributes or information in each bingo square. For example, one square might be "has brown eyes" and another might be "is an only child." Everyone has to mingle and try to find someone who meets a particular attribute. They can then put that person's name in the box. The idea is to get a bingo by completing a row of five names. Have everyone create a story together. Each person has to add a line to the story that builds off of what the person before said. Play word games. There are a number of word games that a group can play to get to know each other. For example, you can play "geography" where someone names a location and the next person must name a location that starts with the last letter of the previous spot. For example, if the first person said "Spain," then the next person would need to name a location that started with the letter "n" and so on. Another word game would involve "linking," so the first person would say something like "green," and the next person would have to come up with a related word like "grass," or "apple," and so on around the circle. In a group, the purpose of ice breakers is to get everyone working together, talking and sharing. Ask your companion who they would have dinner with if they could have dinner with anyone in the world. Ask what books your conversation partner would take with him to a desert island. Ask your companion to name their hero or role model. Ask the person you are trying to start a conversation with if he or she has children or pets. People usually love to talk about their kids or their pets! Ask your companion where they are from originally and what their favorite thing was about their home town. Ask your conversation partner where they would travel if they could go anywhere in the world. Ask where your conversation partner's favorite place is that he or she has already visited. Ask what type of animal your companion would be and why. When looking for ice breakers for one-on-one scenarios, it is best to ask opened-ended questions that give people a chance to talk and to share something about themselves. Everyone appreciates people who are good listeners and who want to listen to what they have to say. "Examples of Ice Breakers." YourDictionary, n.d. Web. 18 April 2019. <https://examples.yourdictionary.com/examples-of-ice-breakers.html>.